*Ski View Mountain Resort* is a peaceful 4-season resort only minutes from the Great Smoky Mountains National Park and the Ober Gatlinburg ski area. 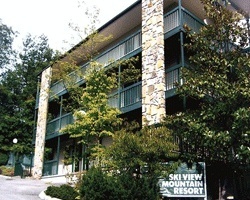 The resort offers spacious 2 bedroom units equipped with full kitchens, washer/dryer units, and private balconies. Spend the warm weather months hiking or biking the numerous mountain trails, and enjoy skiing and snow tubing during the winter. Then return to the resort to relax and rejuvenate in the heated indoor swimming pool or whirlpool spa. Prime season week 41! Year round resort with many onsite and nearby amenities! Memorial Day Week! This is the perfect resort for a peaceful getaway!